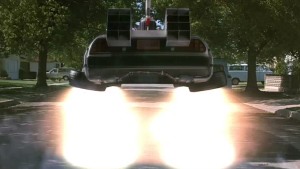 In the final minute of Back to the Future, we were treated to one last glimpse into “the future”…a flying DeLorean! The DeLorean starts to rise off the street, the wheels rotate down, and thrust comes out of the hubcaps. 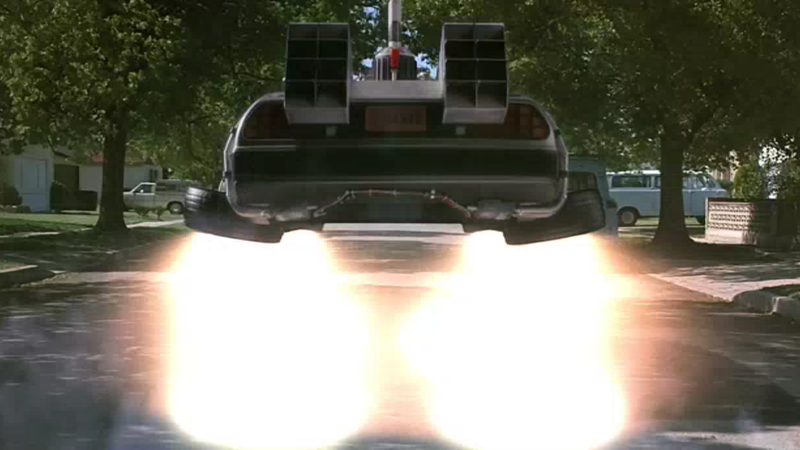 What were reactor cooling vents on the plutonium-powered DeLorean are now thrusters on the flying DeLorean. Somehow, Doc modified the DeLorean and it now flies! Although there have been attempts to create flying cars going back decades (and even pre-dating the Back to the Future films), it’s not a technology that we’ve come close to creating. The closest thing we have to a flying DeLorean in 2015 is a DeLorean hovercraft created by Matt Riese in 2010 which has occasionally been seen on TV hovering in McCovey Cove during San Francisco Giants home games.